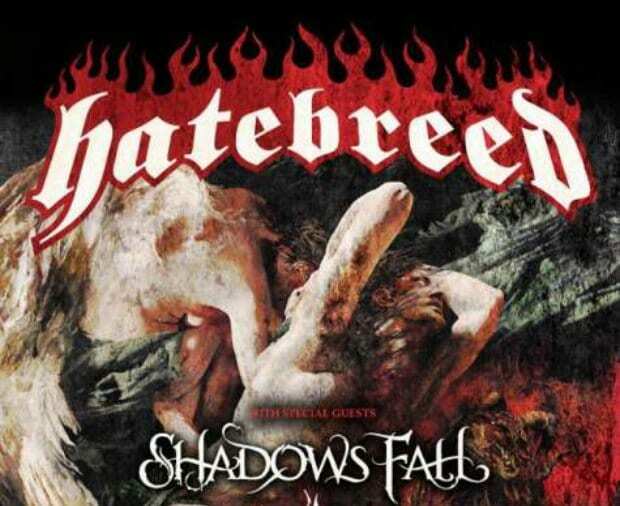 Hatebreed and Shadows Fall are currently on the road together for Hatebreed's The Divinity Of Purpose tour. This week, Matt Byrne from Hatebreed and Matt Bachand from Shadows Fall are checking in with AP from the road to give you a look at a metal tour from their perspective in the second of this three-part blog series. 2. The stage (left) looked like the Looney Tunes outro with Porky Pig saying, “That's all, folks!” The lighting was exact. So awesome. Other notable happenings from this day: I watched the entire Contortionist set from side-stage. Killer band! I sat behind Trey Williams (Dying Fetus) as he shredded on the drums. He's a damn machine! I went to take a shower at the end of the night, but the bathroom was completely destroyed from all the other bands showering. Didn't shower. Gross. 2. Jump one of the slow moving, three-mile long cargo trains that pass by every now and again, and become a hobo. Unfortunately, this time around I did neither. But I can say I've visited the fine, surrounding establishments once or twice in my day. Whenever we roll through the St. Louis/Kansas City area, my generous friends Katie Douglas and Ashley Misako always bring some tasty goodies. Anyone who tours a lot knows the value of a home-cooked meal. It doesn't happen that often, and it's definitely one of the things you miss most about being home. I'm always very appreciative that they take time to make some good stuff. This time around, they brought homemade barbequed pulled pork and cream cheese cupcakes. It was slamming and everyone on the bus got to shredding as soon as the stuff was here. Also, my friend Nick Harp brought a bottle of Jameson to celebrate our record, The Divinity Of Purpose, charting #No. 1 on the U.S. Hard Rock chart and placing No. 20 on the Billboard Top 200. I'm not a serious liquor drinker, but it was good to kick back a shot or two with him in true celebratory fashion. Sick Drummer Magazine came to film some live footage of three to four songs from myself and the other drummers on this tour, they will post it on their website soon, so keep an eye out! 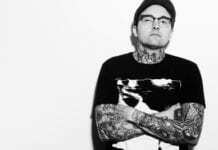 This website features some of the “who's who” of drummers in metal and extreme metal music. Friday night! One wouldn't really think that Lexington, Kentucky would be a rocking city and a rocking show but it was actually off the chain! We did a great meet and greet with fans at CD Central record store before the show. The owner took care of us, and the fans who came out were ecstatic to hang, get some things signed and take pictures with us. I woke up kind of late and had to get right to doing some phone interviews. I hate when my phone dies in the middle of an interview! It's rude and unprofessional. Sorry to the one or two interviewers that happened to. I need to be more proactive about charging my phone at night. As luck would have it, Terry Bozzio was doing a drum clinic in town that night. [Shadows Fall drummer] Jason Bittner knows Terry a bit and had plans to go down and check it out and invited me along. I don't think there is a drummer on the planet who is unfamiliar with Bozzio's playing: Frank Zappa, Missing Persons, etc. He is a true master of his craft, and I was nothing short of excited to see him perform. I got to see Terry jam for a good 45 minutes and even got to meet Rascal Flatts’ drummer, Jim Riley, who was in attendance as well. All in all, a killer night in Lexington. I can't wait to go back. Ah, Nashville. Music city. Always a great time, and tonight was no exception. This time we played Marathon Music Works, which is an amazing new venue that we have never been to before. Since my duties on this tour also include being the tour manager, I don’t get to have as much fun as the others checking out the sights and such. I did find time to stop at Antique Archaeology, the store featured on American Pickers, which is right next door. Of course all it was, besides a few small things, was a tourist gift shop selling History Channel T-shirts. Then it was back to the bus to set up the performance and press schedule for the day. After a quick photo shoot with our good friend Chad Lee and a visit from our old soundman Jake, we had an amazing meal at Ru San’s. If you are ever in Nashville, you should check it out and be sure to order the Tuna Symphony if you are a sushi fan. The show was packed, and the energy was high all the way through. Then, it got interesting as we finished the night at a bar where we had a few drinks before bus call (perhaps a few too many drinks.) And then the 1,000 mile journey to southern Florida was underway. Now this was a rarity on this tour: an actual day off. But it did not start easy. Gainesville was the halfway point of our drive, so we decided to stop there. As acting tour manager, it is my responsibility to book hotel rooms for our bus driver, and on days off we need to find hotels that will allow us to park the 60-foot monstrosity in their parking lot. Of course, the night before I called the hotel to confirm that the parking was possible, and when we finally got there, it was not. As luck would have it, the hotel manager was very nice and did not charge us for the rooms since we could not stay there. After a bit of hotel hopping, I managed to find a place we could stay. Unfortunately it was pretty expensive, but at that point we did not have a choice. After the usual Walmart run to restock supplies and a little browsing at Barnes & Noble, it was time to take advantage of the one good part of the expensive hotel: complementary happy hour! As if we didn’t party enough the night before, our drum tech Willis and myself hit up the bar for some high-octane mixed drinks. At this point, the party was on! After happy hour it was off to the Gainesville Ale house. A lot of wings, several mixed drinks and four buckets of beer later, we stumbled back across the street to the bus, watched a little TV and called it a night. Now that’s what I call a day off. Everybody loves Florida, especially when back home in Massachusetts they just got hit with three feet of snow. Glad I missed that one! The day started pretty much business as usual for me: arranging press, running to the bank, getting the schedule together, stocking the bus, etc. Tonight I finished early so I had a bit of time to go in and check out the show. A couple of fans were nice enough to buy Jon (Donais, guitar) and I a few beers while we hung out by the merch table. The Contortionist and Dying Fetus killed the crowd like they always do. Our set went well and the Florida crowd always treats us right. After the show we had a great time seeing a lot of friends. Being that southern Florida is Jason [Bittner, Drums]’s second home, a lot of his drum buddies came out to hang. Always good to see Nicko, Patrick, Derek and the rest of the gang. Once the night wrapped up, it was pretty mellow and we prepared to head back toward the frozen North.